In over forty-eight years numerous Octets and choirs composed of different faces and sounds, fresh and enthused, have served to fulfill a vision and provide a tangible expression of the hopes of many Orthodox Christians throughout North America for cooperation and genuine unity among various jurisdictions of our Church. In addition to carrying with it the diverse musical traditions that have emerged in the liturgical life of the Seminary chapel and a large selection of Orthodox literature, the Octet and choirs have made the Seminary truly present to those for whom it would otherwise be only a distant reality. 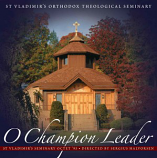 This recording by the 1995 St Vladimir"s Seminary Octet features 21 hymns sung in English. You will hear the voices of: Sergius Halvorsen Director; Priests: V Rev Thomas Hopko, V Rev Paul Lazor; and choir members: Michael Breck, Peter DeFonce, Sergius Halvorsen, Timothy Kozak, Stephen Loposky, Eric Schwartze, and Eugene Wozniak . This recording is dedicated in thanksgiving to the memory of Fr Joseph Olas, member of the original Octet. Memory eternal!